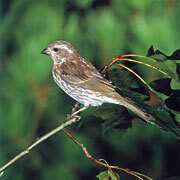 The male Purple Finch is about 6 inches in length and has a raspberry or wine colored upperpart, breast and flanks. The birds colors are brightest in summer. The head of this bird is covered with red and little or no brown streaking on breast or flanks. Often confused with the much more common House Finch often seen at bird feeders, this finch does not seem to show up in the numbers of House Finches. The female has a well defined pattern on the face, broad white eyebrow, brown eyeline, and white cheek. Her underparts have broad, blurry, brown streaking with no streaking on undertail coverts. The immature birds, both male and female, look like the adult female. During the mating season the males will hop and sing in the presence of a female bird. He may hop as high as 6 to 12 inches with chest puffed out and tail cocked. 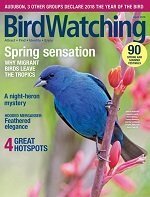 Although he may bring a small amount of nesting materials to the nest site, it's the female finch that actually selects and builds the nest. Once the female selects the nesting site, she builds the nest. The shallow cup nest is made of twigs, grasses, rootlets, and string lined with animal fur, horsehair, moss and rootlets. The nest is placed in the crotch of a tree, usually a conifer, about 5 to 60 feet above ground. The female will lay and incubate 3 to 6 eggs that are light green-blue with dark marks. Once incubation begins, she rarely leaves the nest. The male will feed the female regurgitated seeds. The incubation time will be about 13 days. The young will leave the nest about 14 days after hatching. 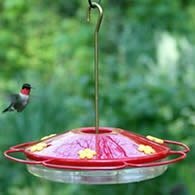 In the wild these birds forage both on the ground and above in foliage for seeds and buds of trees, weeds, berries, and insects. 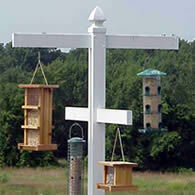 Putting out a birdfeeder with black-oil sunflower seed will almost assure you of attracting them if in the area. 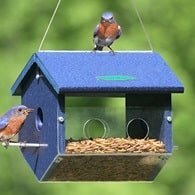 As anyone who feeds birds can tell you, this bird can go through a lot of seed. 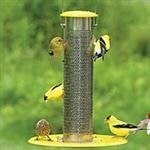 Often taking control of a feeder for hours. 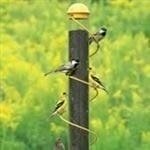 Consider setting up a feeding station. 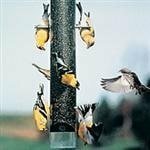 Using both Sunflower Seed Feeders and Thistle/Nyjer Feeders for best results. 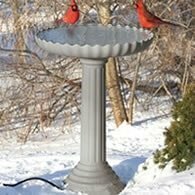 Don't forget the importance of a heated birdbath for a winter water source. 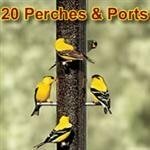 These birds have a wide range of habitat preferences, ranging from evergreen forest to mixed upland wood, orchards, parklands and backyards. 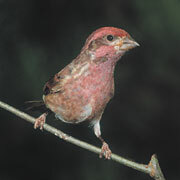 The average lifespan of the Purple Finch is 3 - 4 years. Although it is not uncommon for them to live 6 - 7 years.